* Had a bright moment in the day... my parents brought me my Christmas present early so I could use it. Its a painting I saw the other day. Its of Santa holding baby Jesus... I just LOVE the look in Santa's face - his gaze looking at Jesus. On the back, is the most beautiful poem. I'll post it here on Christmas Day. 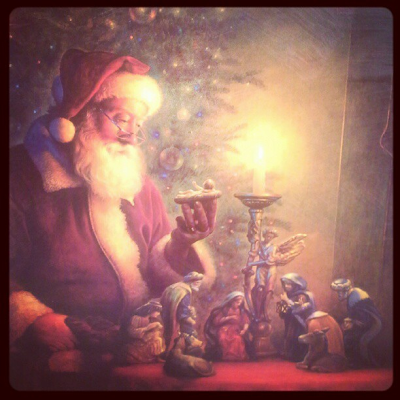 This painting is HUGE ... makes my living room look PERFECT for Christmas Day... Is there anything wrong with keeping a picture of Santa up all year long? * Actually took it easy... with the Hubs not feeling good, we just hung around the house watching his fever since it was his work's Christmas party later that evening. The one day we SHOULDNT be at home relaxing, with all the Christmas stuff we still need to do, we're at home. What a mixed up life. BE WARNED... these next 2 posts are DISGUSTING!!! * So remember when I said we had a few crickets in our basement? I noticed Bruno kept going downstairs. He's a fat dog. He doesnt put forth effort in any shape or form, so why he kept going downstairs, I didnt know. But when I read 'bugs', it hit me. We ran downstairs.... opened up the door..
there were at least THOUSANDS OF BUGS that fell from our door frame... THOUSANDS OF BUGS!!!!! falling out of the curtains, crawling around the door frame. We opened the doors & they just fell like a waterfall.... ARE YOU KIDDING ME??!?!?!?!?!?!? We ended up cleaning up these bugs with a vacuum hose, roach killer (all we had) for over 2 hours! We got it all cleaned - not one bug in sight, close the door, & you'd see bugs crawling back through. WHAT? HOW?!?!?! .... these things are straight from the pit of Hell! * I found an online concoction of mixing water with Garlic powder to deter the bugs... big mistake... our house smells like an Italian restaurant!!!! * Lunch, I had something called "Spasanga" from Cheddars. Oh.my.word. I guess the smell of Italian made me crave something pasta-y. This thing was amazing. & we had the best waitress I think we've had in a long time. I actually went & found the manager of the place when we left to tell him how great she was. * Real Housewives of Atlanta... Kenya is insane. & I love Phaedra every time I watch it. * Totally forgot Survivor Finale was on... dang it... caught the end. I really had high hopes for Lisa. But happy Denise won. She was one heck of a strong lady! * Bedtime... with dreams of bugs crawling everywhere!!! I'm shuddering as I read about those bugs. EWWWW!!! Hope they stay away...time to call the Orkin man! I haven't watched RHOA in a looong time. NeNe is my favorite...even now. Glad Kim is gone. I really like Kandi, too. Glad the hubs is feeling better...maybe some Starbucks will cheer him up! OH MY WORD!!! I wonder what in the world is causing this to happen? Weather? Foundation? I hope you find a solution (one that doesn't cost a lot of cash, either! ).